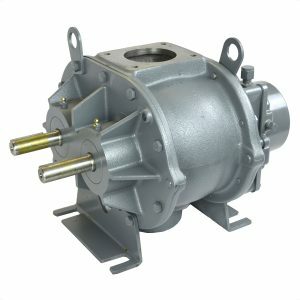 Roots Universal RAI-J Blowers | pdblowers, Inc.
ROOTS™ UNIVERSAL RAI-J™ WHISPAIR™ ROTARY POSITIVE BLOWERS Frames 33J thru 56J are available in 5 different models. All models feature the “universal” mounting feet which allow them to be mounted in four different configurations. 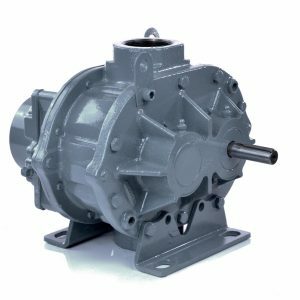 ROOTS™ UNIVERSAL RAI-J™ WHISPAIR™ ROTARY POSITIVE BLOWERS Frames 33J thru 56J. Unit is available in 5 different models. All models feature the “universal” mounting feet which allow it to be mounted in four different configurations. The unit is center-timed so that it may be operated in either direction. These units also incorporate the Whispair feature which reduces the noise approximately 3 to 5 dBA when compared to a conventional unit operating at the same conditions. 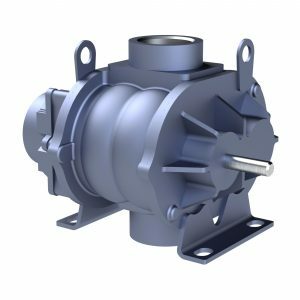 Patented Universal RAI-J™ WHISPAIR™ Roots blowers are heavy duty rotary units in a compact, sturdy design, engineered for continuous service when operated within speed and vacuum/pressure ratings. 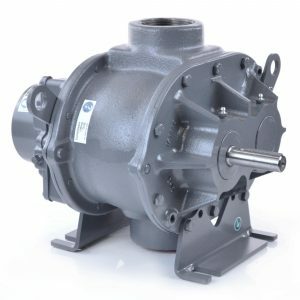 The basic model features a cast iron casing with a computer-designed cast relief for noise and shock suppression, carburized and ground alloy steel spur timing gears secured to steel shafts with a taper mounting and locknut, and cast iron involute impellers. Oversized anti-friction bearings are used, with a cylindrical roller bearing at the drive shaft to withstand V-belt pull. Detachable rugged steel mounting feet permit easy in-field adaptablility to either vertical or horizontal installation requirements. 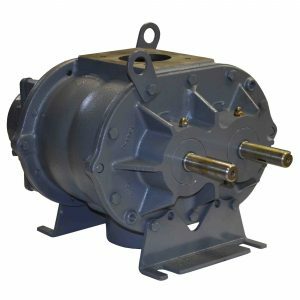 The Universal RAI-J™ Roots blowers incorporate grease lube on the drive end and splash lube on the gear end. ROOTS’ exclusive “figure-eight” gearbox design improves oil distribution to maximize bearing and gear life. 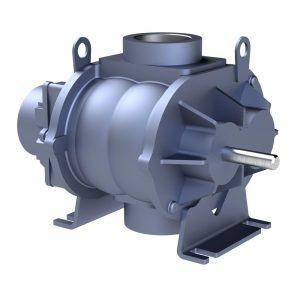 Patented WHISPAIR™ Roots blowers operate with up to 40% less pressure pulsation than conventional blowers, due to the pressure equalizing effect of the WHISPAIR™ jet design. 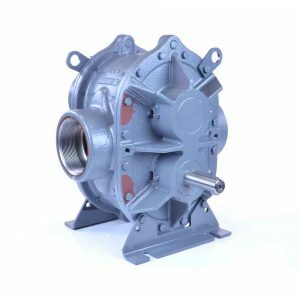 In conventional blowers, as the impeller opens up to the outlet port, the higher pressure air in the discharge line rapidly expands into the lower pressure pocket formed by the impeller and the blower case. The resulting shock wave strikes the advancing surface of the impeller at near-sonic velocity. Four pressure pulses occur during each revolution, transmitting shock loads to the gear and bearings. The pre-pressurization of the low pressure pocket through the WHISPAIR™ jet cavity smooths the pulsations, resulting in less shock being transmitted through the impellers to the bearings, providing longer bearing life. The reduction in the magnitude of the pressure pulsation results in smoother operation for your Roots blowers.